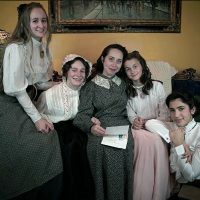 The story of Little Women, Louisa M. Alcott’s famous novel, is so well known and so well loved that it is hardly surprising that many attempts have been made to portray its characters upon the stage. None has yet been so successful, however, as this brilliant dramatization by Peter Clapham. The structure of the play faithfully covers that of the novel, interweaving the lives of the March girls, Meg, Jo, Beth, and Amy, and Laurie, the boy next door, as they grow up happily together.